Former Home Secretary Reid will stand down later this year, with the Parkhead club announcing that Bankier will join the board as a non-executive director and chairman designate. Ian Bankier has targeted success at Celtic after the club confirmed he will replace John Reid as chairman. Former Home Secretary Reid will stand down from his role at Celtic at the annual general meeting later this year, with the Parkhead club announcing yesterday that Bankier will join the board as a non-executive director and chairman designate. The 59-year-old Bankier is executive chairman of Glenkeir Whiskies Limited, a company he substantially owns and which operates The Whisky Shop chain. Bankier told Celtic's official website: "I was brought up in Glasgow and have spent much of my career here and in Scotland. As a long-standing supporter of the club I feel very privileged to be invited not only to join the board of Celtic, but later to become its chairman. "I am looking forward to it tremendously and hope that my own contributions to the future success and well-being of this extraordinary club will be as positive and beneficial as those of my predecessors." Chief executive Peter Lawwell and Hoops boss Neil Lennon both paid tribute to outgoing chairman Reid, who will leave after four years with the club. Lawwell said: "John has been an extremely committed and enthusiastic chairman, and is a true Celtic supporter. The entire Celtic executive, management and staff acknowledge the contribution he has made to the club over the last four years. "We are looking forward to working with Ian as he settles into his new role as a director and chairman designate." Lennon added: "I have benefited enormously from an excellent relationship with the chairman in my short time as Celtic manager. He has provided me with great support and valuable guidance through some very difficult times. "He has been a passionate advocate for the club and the team, and we all wish him well." Reid, who will also stand down as director, was confident he was leaving the club in a strong position. He said: "We have come through a challenging period, but I believe we have come through stronger than ever. We now have in place a new, young talented managerial team led by Neil Lennon and capable of great things. "Equally, we have recruited and shaped a new, young and talented squad whose promise for the future we have only begun to glimpse. "Under Peter Lawwell's stewardship we have weathered the storm of financial recession that has so badly afflicted other clubs. "Hopefully, we have provided impetus to the reform of our wider football institutions. Above all, throughout all of these challenges we stood together, more united than ever." 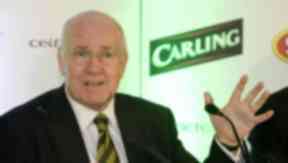 He added: "Chairman of Celtic is a demanding role but Ian is someone of considerable experience and achievement. He will be a formidable addition to the board and will greatly strengthen our development over the coming years."